David Blanchard alerted me yesterday re the Tinder wildfire that had started very close to the KFSX radar. Photo above taken by Claudia Hauser around 2:30 pm MST from near Clints Well looking northeast toward Winslow. 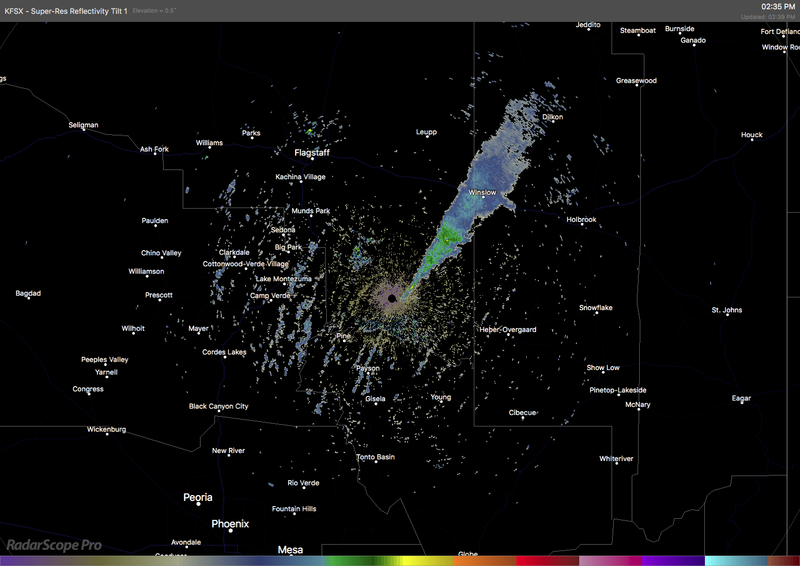 Radar image below (from David) is at about the same time as photo and shows the distinct smoke plume. I was curious and checked the polarization products a bit later at the CoD webpage - algorithm classified the echo as bugs/insects. Second below is visible satellite image from 6:30 am this morning. There are a number of small communities that have been built in the pines that are ahead of the fire. Here in southeast Arizona models forecast continued gusty winds as a cold front associated with sharp 500 mb trough approaches for tomorrow late in day. The 500 mb forecast (above from 06 UTC WRF-GFS at Atmo on 5.4 km grid) is valid at 5:00 am on Wednesday morning. The trough heads toward southwestern Colorado and weakens with time. The WRF-GFS forecast for total precipitation through 5:00 pm on Wednesday is below - most precipitation avoids eastern Pima County once again, if this forecast verifies well. Once this system passes, temperatures at 500 mb warm rapidly and reach to mid-summer type levels by Sunday (second below), when forecasts indicate temperatures at that level approaching -5C. So a roller-coaster ride this week. Background related to this question was started back in posts on April 18 and 19 - detailed, worded forecasts are available for the millions of NWS grid point forecasts that are essentially model-generated. I forwarded Jack's questions along to a number of people I know who are familiar with NWS forecast procedures. The responses I received covered the question about why some of the grid forecasts end up so bizarre, especially when complicated weather events are likely. However, the responses also covered a number of related forecast issues. The majority of responses I received were from shift-working forecasters, although a couple were from folks now retired. A condensed summary of what I received is presented below. Why do the grids lead to such bizarre worded forecasts? Models are getting really good – but programs and algorithms that convert model output to text are not very good. Forecast wording issues reflect problems with the post-processing. Baseline worded forecasts from the various algorithms (in which Regional and higher levels seem to have no interest) are basically considered “good enough.” There is minimal investment in meteorologically sound, post-processing systems. Absurd public text forecasts occur because there no longer is importance given (at different Headquarters levels) to issuing worded forecasts that make sense. Why not average model output over three-hours, or use “wintry mix” instead of things like “rain, then snow, then rain mixed with snow, then freezing rain”? There need to be more people working to make these kind of improvements. A related issue is that forecaster attention is increasingly being shifted/mandated to “IDSS” (Impact-based Decision Support Services) and various social media and away from direct involvement in the daily forecast process. Forecasters are stuck in a trap re providing best product for public but they are also required to produce “pleasing” maps. Today it's more about collaboration, chat rooms, webinars, conference calls, Facebook, etc., and direct interaction with users in real time during events. The overall trend in forecast services isn't surprising. Many could see the proverbial writing on the wall many years (even decades) ago. Fewer people in our urbanized truly need to know about weather details –the small fraction of people who need detail probably know better sources than NWS text forecasts. Models have improved steadily while forecasters have not (meteorological cancer as per Snellman and many others). Most of time human forecasters can’t do better than blended models on days 4 to 7. Waste of time for forecasters to try to improve base variables in the forecast except in frontal/convective situations and western US complex terrain effects. No problems with blended model forecasts producing the forecast beyond day 3. Fully automated forecasts are the future in public sector forecasts. In public sector forecasting emphasis ($$) has mostly been in NWP with little investment in humans. It is sad but true – the negative momentum against human forecasters is unstoppable. There was a bit more cloudiness overhead than I expected yesterday. The evening sounding from TWC (above) indicates that the middle-level moisture persisted and that the WRF predicted sounding was too dry above 500 mb. The GEFS plumes for parts of Arizona and New Mexico produced too much QPF; however, the WRF-GFS was quite accurate for the three days leading up to yesterday. Regardless, there was perhaps a sliver of CAPE present from about 600 to 400 mb, This allowed deep enough clouds to develop, at cold temperatures, and produce some ice and snow virga. Net result was a colorful sunset. The regional plot of detected CG flashes (from Atmo and Vaisala) below is for 24-hours ending at 1:00 am MST this morning. Arizona was totally devoid of CG flashes and over in New Mexico there were CGs and a thunderstorm or two over Catron County, southwest of the Large Array. As far as precipitation, I found only a couple of sites along the Rim Country that measured a hundredth or two. Looks like April will wind down as a windy and dusty, but rainless month here. First a look at some observations this morning. The 500 mb analysis (above from SPC) is for 12 UTC this morning. Although a high-amplitude ridge dominates western North America, there is slight troughiness moving through the ridge along the Borderlands. Of interest is the sounding data from Guaymus - let's hope that station stays in operation through the summer. The IR satellite image below is from 6:30 am MST standard time and there appears to be middle and upper-level moisture and cloudiness to our east that extends northwestward across parts of Arizona - the El Paso morning sounding is quite moist above 600 mb. The 12 UTC sounding for TWC (above, also from SPC) indicates no CAPE this morning and only 16 mm of PW - there is actually almost no gradient in PW from here to El Paso. The observed winds and moisture distribution indicate that most mid-level cloudiness will remain to our east today. The skewT below is from the 06UTC WRF-GFS and is the forecast for 5:00 pm this afternoon - the mixed layer CAPE remains zero and there is perhaps enough moisture around 500 mb for some clouds. The operations GFS continues extremely dry (see blue trace in TUS plumes below). The 06 UTC plumes for QPF from the GEFS shown here are for TUS (above) and Deming, New Mexico (below). The GEFS forecasts much better chances for showers and high-based thunderstorms to our east, while the Tucson forecast is quite dismal. The forecast from the WRF for QPF through 5:00 pm tomorrow (second below) is also quite dismal, keeping light showers along the state border and eastward into New Mexico. Continues to appear that we may observe some high-based Cbs over the mountains off to our east late afternoon and evening, but little chance for anything in the Metro area. The model forecasts from last night continue to weaken the northward push of moisture along and east of Continental Divide. The 06 UTC WRF-GFS forecast from Atmo for PW (above on 5.4 km grid - valid at 5:00 pm MST tomorrow afternoon) shows this with best PW returns south and east of the Texas Big Bend country. The forecast soundings from the same WRF forecast run indicate just a sliver of CAPE tomorrow afternoon and evening for Tucson, with cloud bases between 600 and 500 mb. We may see isolated, very high-base Cbs off to the east tomorrow but there's little chance for anything over the Metro area. Satellite IR image below is from 6:30 am this morning and shows plume of mostly high-level cloudiness coming our way, but main impact likely to be few periods of dreary, thick high and middle cloudiness. The 06 UTC runs of both the WRF and the GEFS ensemble trended drier from here eastward to Deming, as the return flow on west side of Plains high weakened some. Above is 06 UTC WRF-GFS from Atmo - note the new and expanded domain over which the 5.4 km grid version is now running. Plot above is the forecast of total precipitation through 00 UTC on May 3rd. It is important to point out that the operational version of the GFS (which drives above) is very dry. Light Showers Before End Of Month? First time in a while for an am cloud photo - iridescence (sun dog?) at 22 degrees north of sun but no clouds to south. As high pressure moves south over the Plains late in week, moisture increases on its west side. Shown above is 00 UTC WRF-GFS forecast (on the 5.4 km grid) for PW valid at 6:00 am MST on Saturday morning (28 April). Highest values remain along and east of Continental Divide but moisture does increase some into southeastern Arizona. 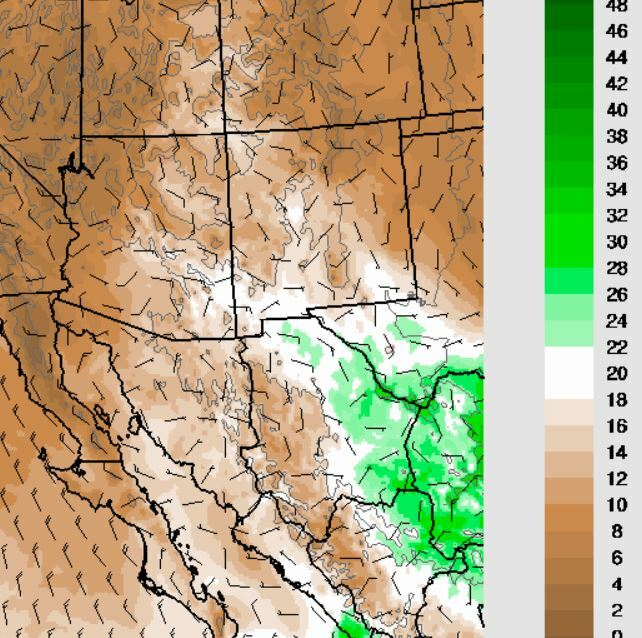 The GEFS plumes for QPF reflect this moisture gradient - shown below from top to bottom are: QPF forecasts for Tucson (top); Douglas (middle); and Deming, New Mexico (bottom). So, a bit of possible weather activity to monitor rest of week. 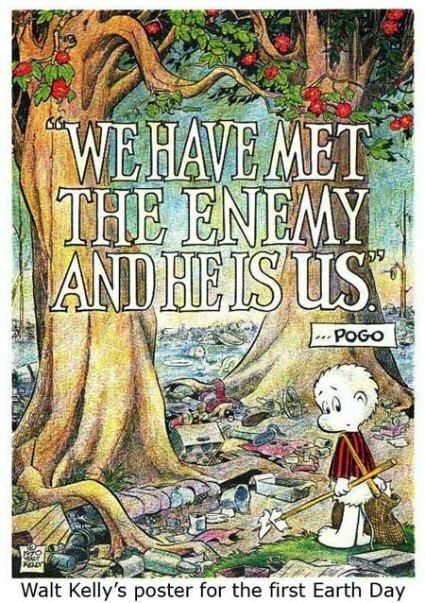 Walt Kelly's famous Pogo poster done for the first Earth Day back in 1970. 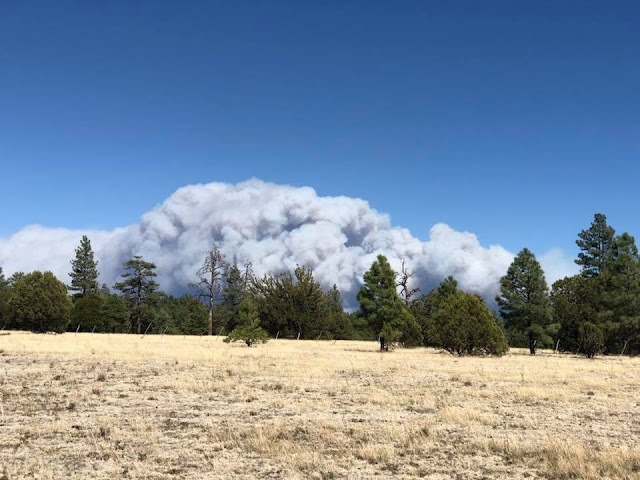 I went off to Colorado State to work on my Masters in 1972 and was shocked by the terrible air quality and noxious brown cloud. Back then the only city with worse air pollution than Denver was LA. 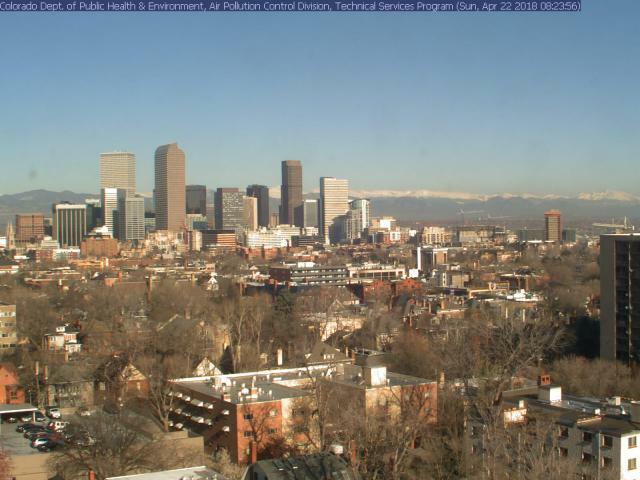 Over the years much progress has been made due to a number of changes that were driven by air quality regulations that were put into place along the Front Range - as per the two images shown here - 1970s vs this morning. Let's hope that the common sense of the majority will prevail during this trying time and that our air quality will not be allowed to deteriorate back toward what it was in the last century. 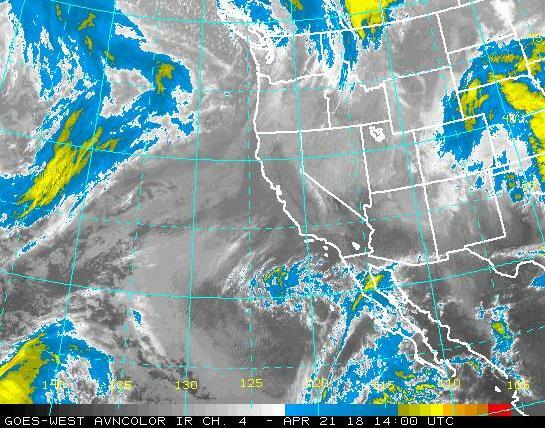 This morning the 14 UTC IR satellite image (above) indicates a system west of northern Baja. The MIMIC TPW analysis for same time (below) shows little with this system - indicating mostly middle and high clouds, as per many recent systems. The models forecast this system to weaken rapidly and move across northern Mexico tomorrow - perhaps some clouds locally as this occurs. Second below is the GEFS average 500 mb height forecast valid out at 00 UTC on 28 April - strong, bent-back ridge over the West - so not much hope for any meaningful rain again this month. Down at bottom is photo of Harris hawk atop a pole near Country Club and Allen this morning - note the little finch keeping an eye on the much larger hawk. most, if not all, of Sunday should be dry. Note - southern Illinois was dry and mostly clear on the Sunday mentioned above (Easter Sunday). Snow and sleet likely before noon, then rain, snow, and sleet likely between noon and 2pm, then rain likely after 2pm. Scattered rain showers before 9pm, then a chance of rain and snow showers between 9pm and 10pm, then a chance of snow showers after 10pm. Freezing rain and sleet likely before 9am, then rain likely, possibly mixed with freezing rain between 9am and 10am, then rain likely after 10am. Rain showers and sleet likely, possibly mixed with freezing rain before 2am, then snow showers likely, possibly mixed with sleet between 2am and 3am, then snow showers after 3am. 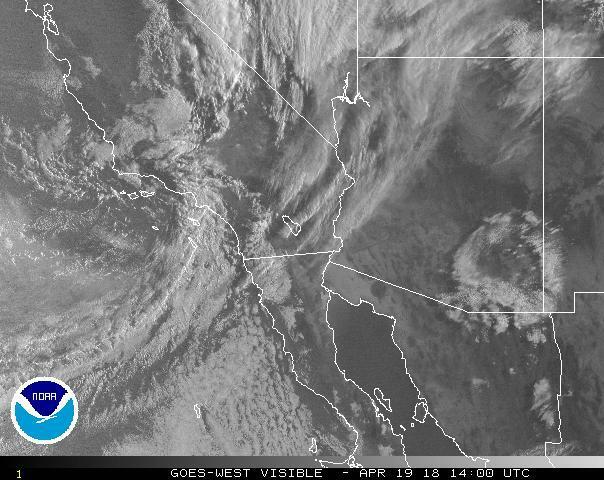 This morning a 500 mb short wave (above from SPC is 12 UTC analysis at 500 mb) is oriented south-to-north across California, with a surface cyclone over the LA Basin (visible satellite image below is from 7:00 am MST). The 500 mb system is forecast to close-off and move eastward across the Great Basin, bringing Arizona another very moisture starved system, but with wind and dust yet again. Continuing to focus on the NWS digital, high-resolution grid forecasts, above shows the forecast wind gusts for 2:00 pm this afternoon. Below is the hour-by-hour grid forecast for the airport today, and the bottom is the text forecast for airport. Note that text forecast is same as grid forecast for wind, but with blowing dust added to text. More on digital forecasts later today. I have been trying to understand better the gridded forecasts that are available from the NWS (millions of grid point forecasts updated every few hours). These forecasts are easily accessed from the Forecast Office websites under the graphical forecast links. The grid point forecasts cover seven days at 1-hour time intervals. The NWS contracts with esri to provide the graphics for the mind-boggling set of products being generated (i.e., environmental system research institute of Redlands, California). Shown above is the current digital forecast for high temperatures today across our region. 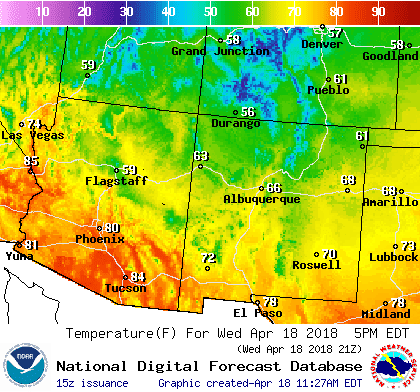 Another graphic (above) shows the gridded digital forecasts for wind gusts valid at 2:00 pm MST tomorrow (Thursday, April 19th). The display below shows the grid point forecast extracted from the massive data base by clicking on a point location (the interactive forecast map provided on NWS web pages). The wind forecast is for San Simon, Arizona - a location where I-10 in eastern Cochise County is frequently closed during blowing dust situations. How accurate are these deterministic, point forecasts out through 7-days? Good question, and my experience watching them leads to my subjective appraisal - not very good, especially at longer time periods - but sometimes distressingly bad at only a few hours. When I tried to access verification data for the gridded forecasts, I found that that NWS link is restricted for only visitors having a noaa.gov email - so no luck there. My digging has been stimulated by a question from Jack D, currently located in southern Illinois. Simply put his question was: Why are the NWS point forecasts so bizarre? More on this issue in next post. 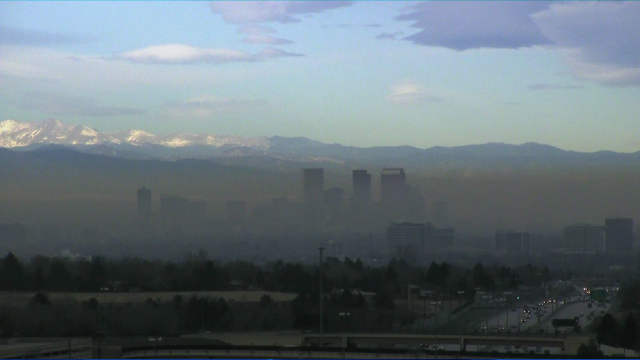 Dust still hanging in the air this morning - early morning RH has only crept up to a very dry 13 percent. The 06 UTC GEFS plumes for wind (below) key on another spate of high winds for Thursday. The 06 UTC WRF-GFS forecast of 10-m winds valid at 4:00 pm MST on Thursday (second below) indicates the same. Down at bottom is commentary on the ridiculous state of NWS short-term forecast graphics - this will be first of several posts about the problems with grid forecasts and meteorological absurdities. If one goes to the NWS TUS web page this morning he/she finds both of these graphics about a Red Flag Warning for today - obviously a very short-term and important product. The real warning area is above; whereas the point-interactive graphic (below) that brings up the supposedly "high resolution" grid point forecasts shows a much larger area. 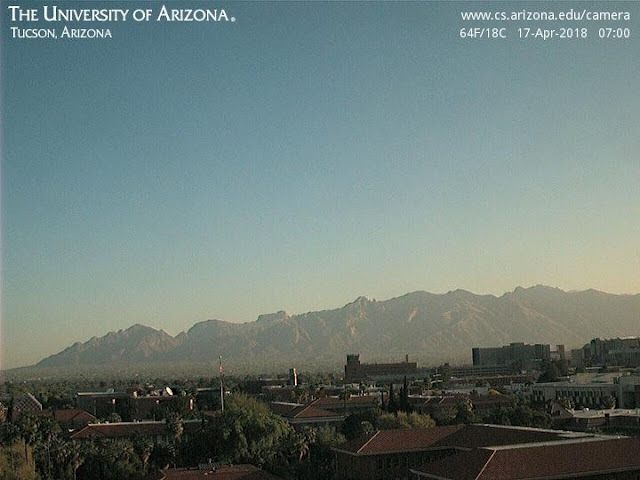 What I find inexcusable is that a click, say on TUS, indicates a Red Flag Warning in effect - but this is not so for Tucson. Such inconsistencies at very short-terms should be totally inexcusable - but apparently management in NWS at Regional and National levels does not care. It was very windy across much of Arizona yesterday, as per forecasts, with gusts of 40 to 60+ mph common. 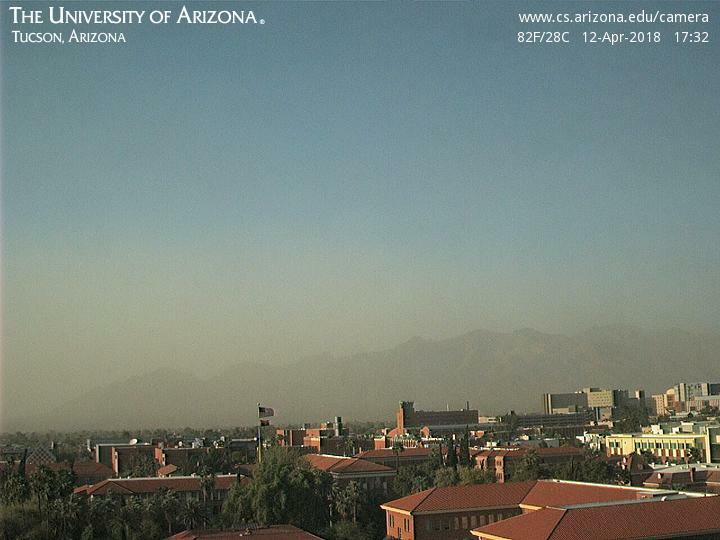 I estimated gusts to 50 mph here during mid-afternoon, as blowing dust obscured the mountains (above). The GEFS plumes from 06 UTC forecast last night (below) indicate three windy periods at airport for coming week. 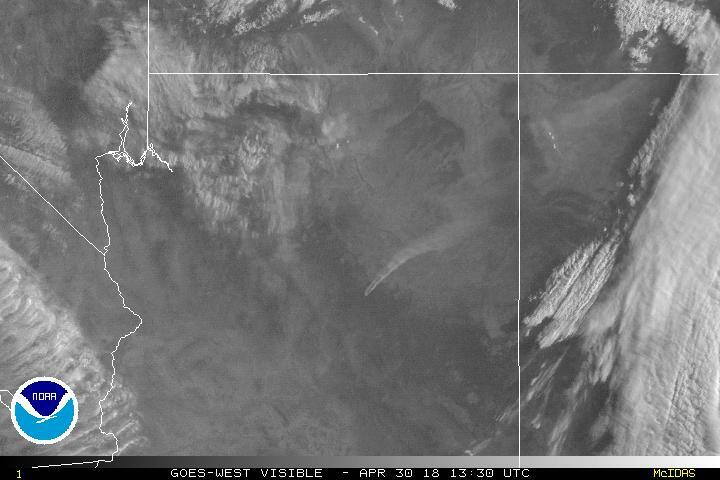 Nasty wildfires continued into the night over western Oklahoma - as per news blurb at bottom.